From early explorers and Gold Rush days to modern times, British Columbia has always attracted visitors. Its rich landscape is filled with forests, glaciers, and rivers that draw outdoor enthusiasts; more rugged adventurers ride the Alaska Highway, an engineering marvel that cuts across the territory amid stunning scenery. Colossal mountains tower over behemoth rivers that carve gigantic valleys. Everything is giant sized, including the salmon, which draw eager anglers who fly into remote areas and compete only with grizzlies for the catch. Thousand-year-old Western red cedars in BC reach astounding sizes, and their trunks can measure up to 60 feet around. In the midst of all this lies Vancouver, consistently voted number one among North America's cities. Or visit Victoria, considered by many to be the nicest spot in North America. Scenic railways offer unique opportunities for relaxed sightseeing. Offshore are the Queen Charlotte Islands, where kayaking is a popular sport. This guide is produced by the authors of our best-selling Adventure Guide to the Inside Passage & Coastal Alaska. 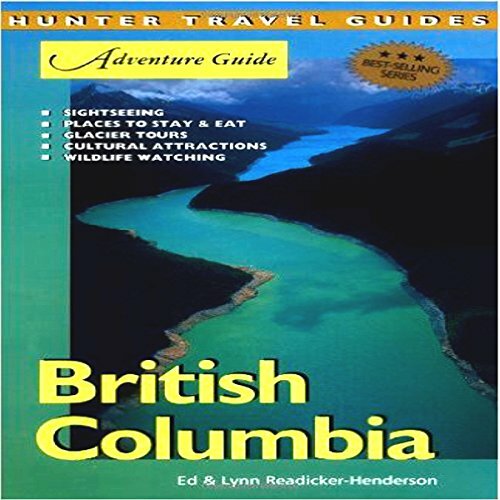 But here we tell you about everything British Columbia has to offer, from the often-photographed Butchart Gardens in Victoria to the Tatshenshini-Alsek Wilderness next to Alaska. It covers the parks, such as Yoho, Banff, Jasper, and Kootenay. Cities and towns are profiled in detail, with hundreds of restaurants, sightseeing, historic tours, and more. Accommodations are reviewed at all price levels, including five-star resorts, one-of-a-kind hotels, small B&Bs, and budget choices as well as camping and RV options. The authors point out when and where you're likely to spot wildlife - bears, moose, fish, and eagles - and offer tips on how to capture these animals on film. Recommended outfitters can take you flightseeing over glaciers, hiking into the wilderness, rafting over the rivers, or fishing in the mirror-still waters. All the details are here.